Submitted by dmbpj on Mon, 10/06/2008 - 11:52pm. 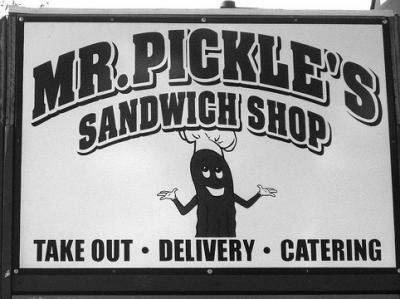 Mr. Pickle's Sandwich Shop sandwiches are made with high quality meats, served on delicious San Francisco style breads - freshly baked, we offer a choice of five different cheeses and also include "everything" (mayo, mustard, our special recipe garlic sauce, lettuce, tomato, pickles, peppers, onions). There are a variety of delicious sandwich combinations that have become tried and true favorites, or build your own. We also offer a variety of freshly made salads.